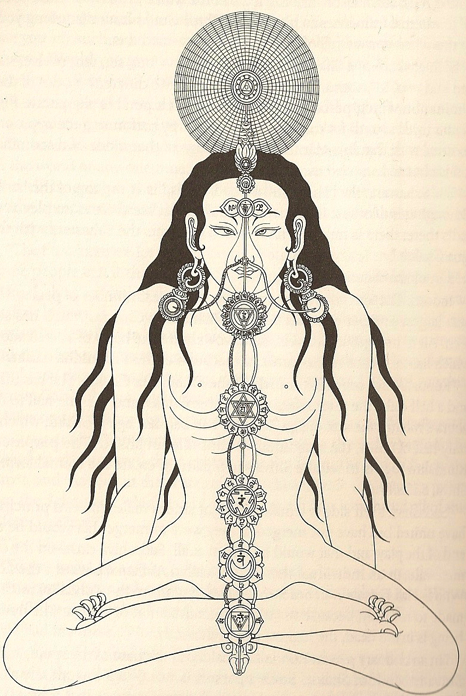 The lower extent of the Thrusting Vessel, also known as the Penetrating Vessel, or Chong Mai (image) in Chinese Medicine and Acupuncture, begins as the primary pathway for the electrical signals created during internal alchemy practices or kundalini practices. In many spontaneous kundalini risings, kundalini follows the thrusting vessel to its apex, and then subsides, creating a brief but powerful experience with little permanent change in consciousness. However, steady practitioners of internal alchemy or kundalini meditation gradually awaken a more straight, direct, vertical pathway, which sanskrit calls Sushumna Nadi (image), and Chinese internal martial artists and alchemical practitioners refer to as the Taiji Pole (image), the true vertical axis of the body. It is this “adjusted” penetrating vessel / pathway of electrical activity in the body direct from bottom to top, using the spinal nerves, the vagus nerves, and the interstitial fluid pathways, that allows for the opening of feelings of enormous compassion, love, and connection from the heart/thymus, as well as feelings of oneness and cosmic consciousness from the core areas of the brain. This rewired neural/endocrine network is achieved and strengthened through movement of breath and placement of sensory awareness along its length, with intentional amplification of sensation and emotion. The continued processes and realizations in alchemical and esoteric yoga traditions after the initial upward re-wiring of this pathway for kundalini may follow more curvilinear, feminine pathways back down and around the body as those “cosmic” experiences are reintegrated with more human and mundane experiences, or may follow the same straight pathway back downward. KAP is a simplified method that embraces the biological changes that occur throughout kundalini’s evolution in the body, and facilitates them for a faster, smoother, safer, change. It makes use of 5 prerequisites for a permanent kundalini awakening. Level One contains all the necessary practices for a safe, rapid, permanent kundalini awakening. Level Two classes also begin shortly. These teach more precise and more amplified ways of using the bodies systems, and integrating internal and external experiences of energy and consciousness, using the materials taught in level one as a foundation.